Udaipur is the most beautiful city of Rajasthan. The level of its beauty can be easily deciphered from its nicknames like ‘Venice of the East’ and ‘Kashmir of Rajasthan’. There’s no second opinion to the fact that Udaipur has been blessed with mesmerizing natural beauty that can enchant any individual. And the rulers of the city too have contributed to the beauty of the city. The ‘city of lakes’ is no doubt a pleasant oasis amidst the scorching desert. There are various reasons for Udaipur being irresistibly beautiful for every individual regardless of their personal tastes. 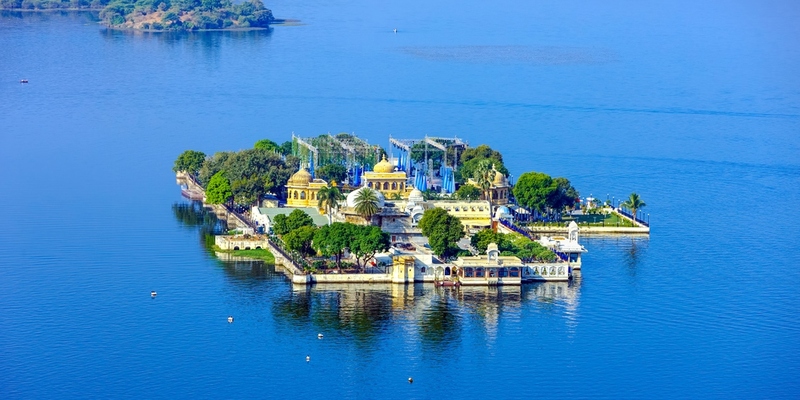 Udaipur is renowned as the city of lakes for a genuine reason. There are more than half a dozen of beautiful lakes that increases the serenity of the city. The lakes not only fulfil the water needs of the city dwellers; they make the perfect backdrop for the picturesque city of Udaipur. The lakes of Udaipur stand as the example of human creative power as the majority of them are artificial lakes build by human-beings. Udaipur lies on the southern slopes of the old fold-mountain range known as Aravalis. This is the nature’s gift to Udaipur that gives it heart-conquering sights. The undulating hills of the range bless the city with beautiful ambience. The rare flora species characterising the area enhances the romantic beauty of Udaipur many folds. It is this range that separates Udaipur from the Thar Desert making it strikingly different in better way than the surroundings. The history of Udaipur is so rich and royal that its clear effects can be seen till date. The whole city gives the royal feeling with the numerous palaces spread all over the city. There are various palaces such as the City Palace, Fateh Prakash Palace, Shiv Niwas Palace and many more. These palaces have kept the history and heritage of Udaipur alive till date. The spell-bounding palaces built on lakes have multiplied the beauty of the city. They are like mergers of two heavenly beauties. Being part of Rajasthan, a desert, the summers of Udaipur are hot. But that hot summer remains only from March to June. The monsoon arriving in July makes the place more beautiful. The sporadic rainfalls of Udaipur make the view of lakes and lush greenery much more enchanting. This enhanced beauty makes Udaipur one of the top monsoon destinations of the country. The winters of the city are very comfortable with sunny days and cool night. The winters of Udaipur are the most appealing time for visitors all over the world. And the winter stays here from mid-September to March or early April. So on an overall view the climate of Udaipur is welcoming for the major portion of the year. The rich tradition of Udaipur has developed it into a land of craftsmen and artisans. The people of Udaipur are very creative in handicrafts. And, they keep on enhancing the beauty of the city with their creativity thus attracting tourists from all over the world. The decorative items, puppets, paintings, handmade bags, clothes and shoes everything made in Udaipur is vibrant with colours. The handicrafts created here have their own signature that one cannot find in any other part of the world. Not only are the handicrafts the people of Udaipur too are colourful and unique in their own way. They accept the developmental changes happening around the world but without losing the warmth of their own traditions. These explanations are just the fringes of the original beauty of Udaipur. The beauty of the city is so mesmerizing that it can only be felt when you see it yourself. You need to check IRCTC train schedule and book the ticket to visit the city yourself for experiencing the perfect combination of natural and man-made beauty of the city.